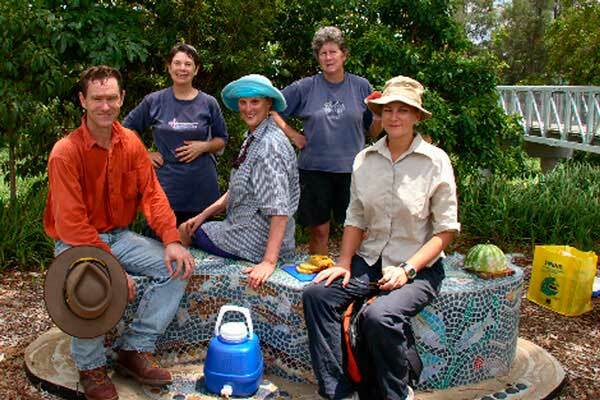 This group commenced in July 1998 along the banks of Kedron Brook off Osborne Rd Mitchelton (opposite the entrance to Teralba Park) This roughly covers the eastern bank of the Brook from the Osborne Road bridge up to just past the Greenway bridge that crosses into Pony Club Bend. (See UBD Ref Map 138 L2.). The group and has steadily replaced weed species like Tecoma (yellow jacaranda), Singapore Daisy, Madeira vine and Glycine with appropriate local plants. Approximately 3500 plants, ranging from grasses to trees, have been planted to try and recreate lost habitat. Weeping lillypilly (Waterhousia floribunda) is naturally regenerating in the stream bed. 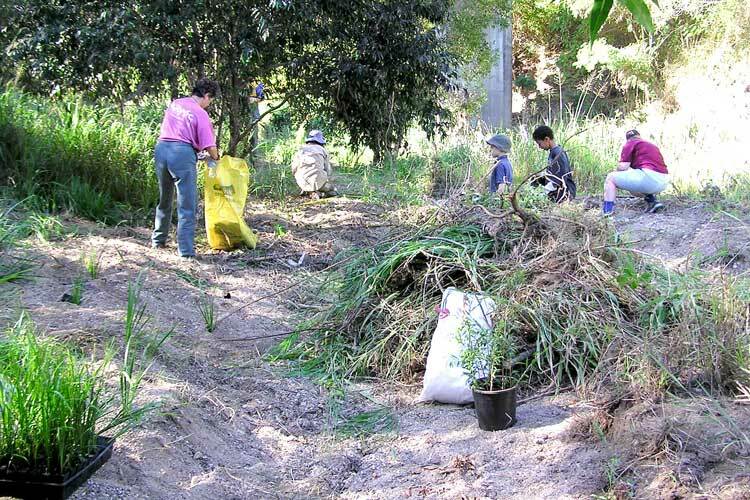 Participation of volunteers has come from areas including the Everton Park Saturday Cub Scouts, students at Grovely TAFE, Conservation Volunteers Australia, Greening Australia and local residents. Fauna sightings include kingfishers, swallows, wrens, honeyeaters, pheasant coucals, carpet snakes, bandicoots and even a lone Rufous Night Heron in the creek bed. 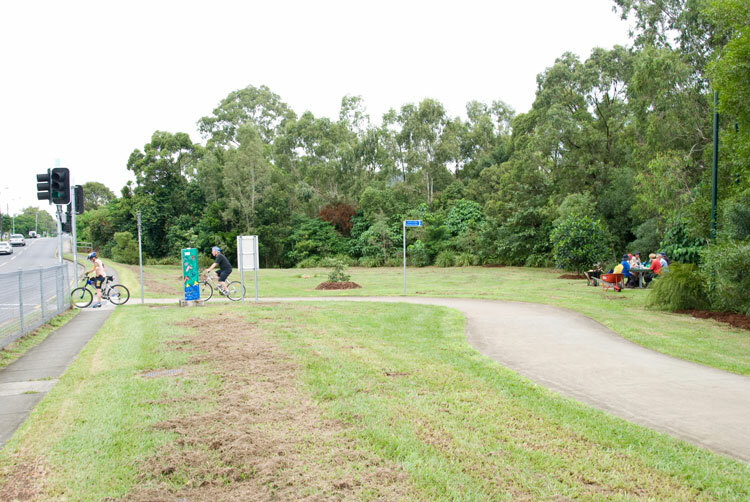 In March 2008, an extension of the Greenway was completed from Osborne Road (opposite Teralba Park) to Lansvale Street. This included one of the longest bikeway bridges over the Brook. See the details on our Projects section page. In 2010, Kedron Brook bikeway, stage three, finished a final link in the Kedron Brook bikeway network between Teralba Park and Woking Street at Mitchelton. From 2008 through to early 2011, there have been periods of heavy storms. The resultant flooding has scoured the creek bed and banks removing weed but also the results of many plantings of trees by this group. 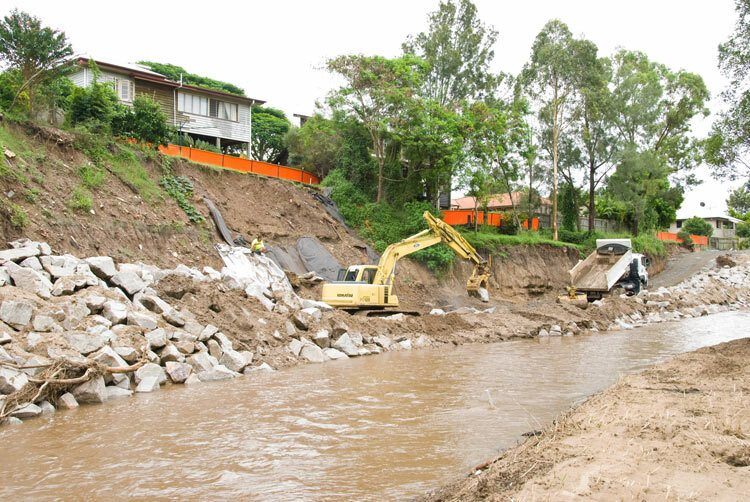 Severe bank erosion along the McConaghy Street section of the Brook endangered four properties and their dwellings. 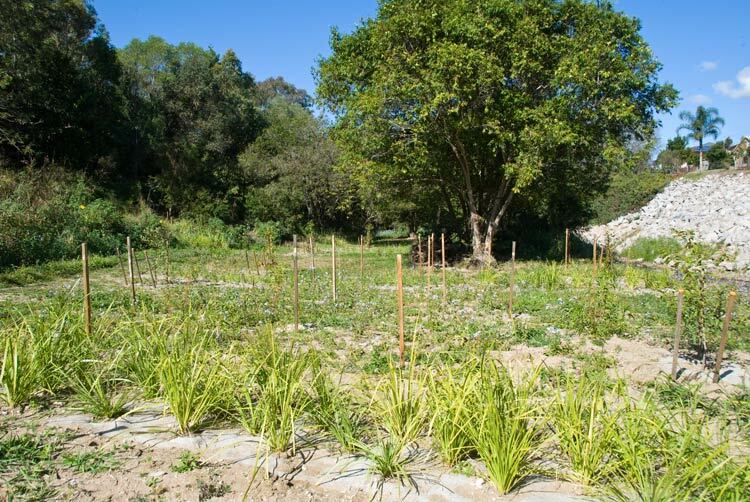 Brisbane City Council has now greatly strengthened this bank but the associated modification of the creek bed now threatens to wipe out the beds of Lomandra, the main plant the group has found to handle the flooding well at that level. Click on each thumbnail to see larger image. 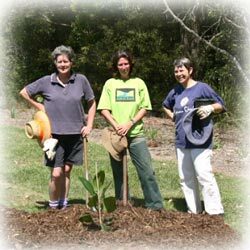 In 2004, this group removed the grassy weeds and planted a good crop of Lomandra on the creek bank close to the water. At the February 2009 activity, the crew ended up with tea break on the mosaic tile-covered seat situated near the Osborne Road end of the Pony Club Bend Greenway bridge. It is covered with beautiful scenes depicting bird and aquatic wildlife. (Tiling design, preparation and placement by Janet White). 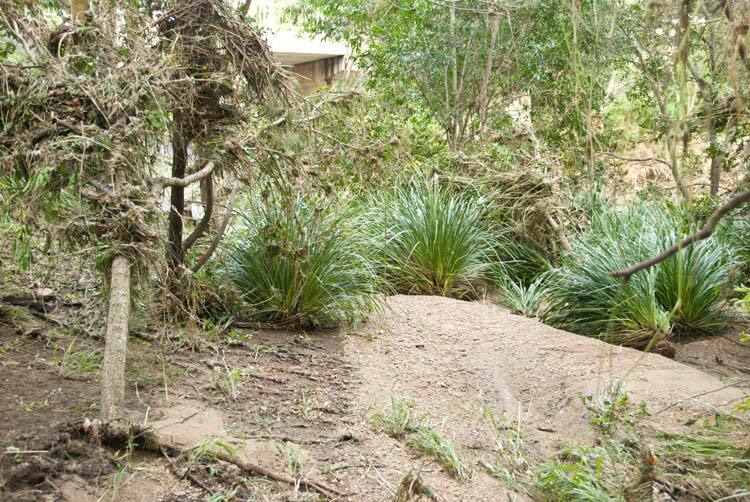 In 2009, heavy flooding removed many plants except for the Lomandra that did suffer some root scouring but essentially these plants survived well. After many storms in 2008 through to early 2011, established trees lost branches and in some cases were up-rooted. 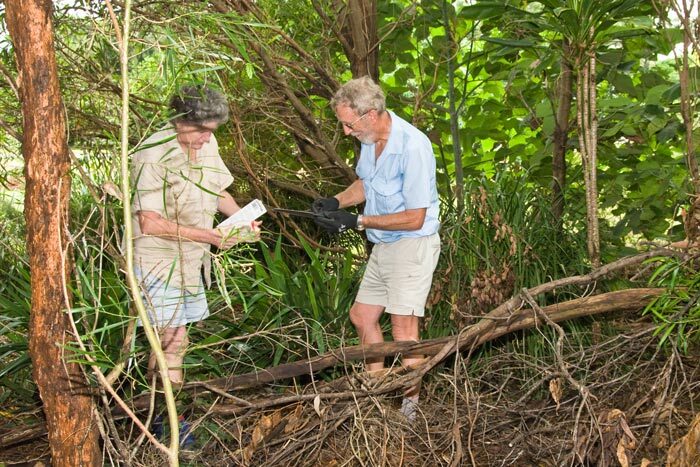 Here, Bushcare Leader, Keren Sweeney, and Harold Charles are cleaning up at the March 2011 monthly maintenance activity. View south down Osborne Road close to the traffic lights allowing the Greenway traffic to cross to Teralba Park. 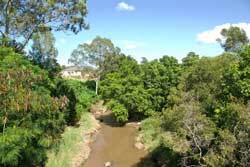 The lush bushland on right is result of continuing efforts from this group. This dull day in March 2011 doesn't do the good work justice. After the planting of Lomandras and long-stem seedlings of native trees was carried out on 8 June 2011. Part of the massive rock bank protecting properties can be seen on the western bank of the Brook to the right. 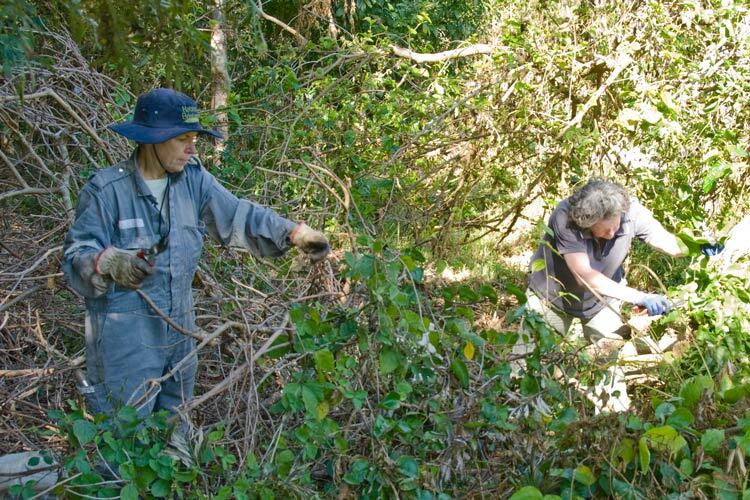 Rita Collins and Keren Sweeney toil away on 6 August 2011 to clear a large area of Glycine. This creek bank is also degraded with Japanese Sunflower. 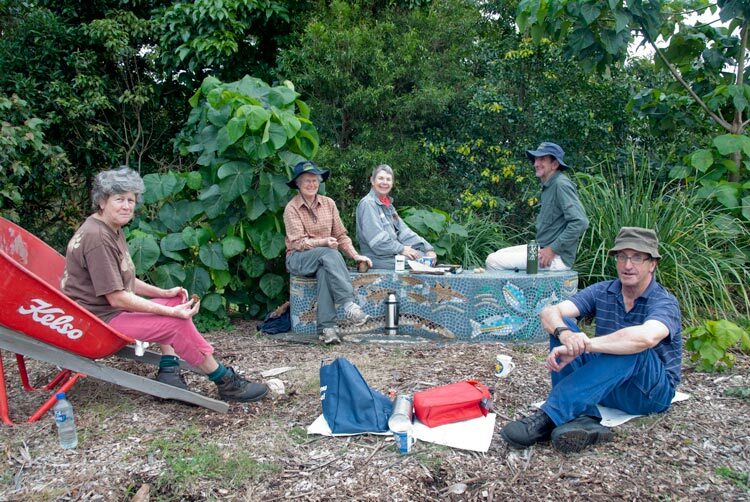 Morning tea break on 1 June 2013 using the mozaic clad bench adjacent to the Greenway bridge. Barrows and mats provide alternative seats! 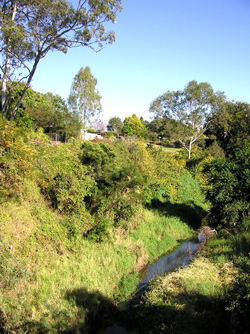 Section of Kedron Brook shown in June 2004 before bank erosion. The engineering works undertaken to halt erosion of the housing properties at McConaghy Street included some bull-dozing along the eastern bank in order to open up the area of the small flood plain at this point. This should lower water velocities at flood time but also had an unfortunate effect in that large areas of well-established Lomandras were removed in the process. The Habitat team spent a few big days preparing the site and planting twelve of each (120 trees total) from the mix of ten specially-raised tree species. This work is helping to re-establish vital native cover for this section of the Brook. Our bushcare group will eventually take-over the follow-up maintenance of this area and, if the planting is demonstrated to be successful, this planting technique could be applied possibly up and past the Greenway bridge. In between necessary routine weeding and general maintenance, it is hoped to get a set of proper steps down to the bottom of the road bridge, perhaps extend revegetation up past the Greenway bridge and maybe even make a Frog hollow somewhere. We welcome anyone and everyone to enjoy our bit of the Brook. The group meets on the 1st Saturday of each month, 9 am to 12 md. Activities usually start from near the Osborne road traffic lights opposite Teralba Park. via Brisbane City Council on 3403 8888 or She can also advise about any basic protective clothing and footwear you'll need and safeguards against insects and sun.